Leave a comment on Canning … well, eating. Cast your votes, ladies and gents: would you believe the amount of heat that onions can hold? Too much hot. Which means that the single pint should be about right, and will be the recipe we use for putting up spiced onions. Standard pickling brine for onions, plus 1 Tbsp Peppers of Death per pint jar. 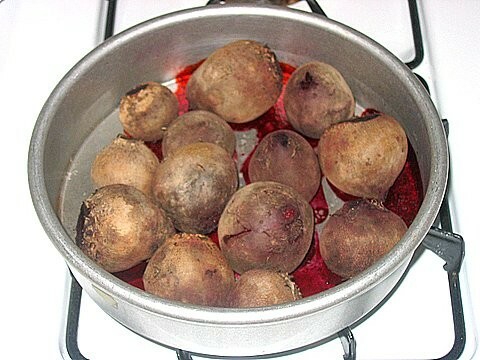 …just remember that you’ve eaten beets, okay? Or you could well give yourself a heart attack a day or so later. And we’ll draw a veil over the rest of THAT brief episode. We thought, for a second, of getting an induction oven. That being said, we must also admit that we didn’t really know what an induction oven IS. An induction oven is *NOT* just a smooth-top electric stove, although I suppose it has a smooth top and looks reasonably electric. No. It’s something else. It’s something that works via electromagnetic field, prompting people who work where phrases like Clinical Electrophysiology are common, to question whether or not people just mightn’t get radiation sickness from these fine scientifically progressive machines. I know we might like to bake and all, but I’m not sure this one’s worth it. For one thing, Consumer Reports doesn’t carry any comparison pricing, etc., info on it, because it’s too new and not yet a really ‘finished’ product for mass production in full ranges. For another thing, it’s priceeeey just to buy the single cooker units, pricewise, it’s the equivalent of buying a single electric burner for almost $200, and I’m not sure what baking we do is worth the cost. third, there’s the whole EKG disruption, radiation poisoning thing people worry about from cell phones and all of that. 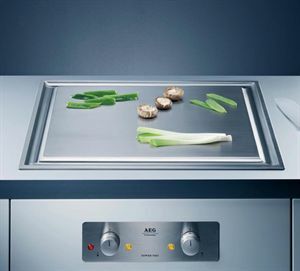 Now, there’s more information than you could ever want on induction ovens on the web, and no one says the death-via-radiation theory is true, but I do wonder if the rumors didn’t start just because it’s such an energy saver appliance. Anyway, the price checking continues. Meanwhile, something must be done soon… the range situation is dire. Lest I sounds like an obsessive one-note on the topic of the remodel, I will just say I am having dreams about Kenmore appliances. Be afraid. Meanwhile, in more food ramblings, amusing ex-pat Chris Cope enjoys some of the best flavors of the UK… one wonders if the ox crisps are spit roasted or what. Just got back from the garden, and am disappointed in my little Kermit (yes, confirmed it by the label) eggplant: they don’t have enough size to harvest any more this week. The zucchini and yellow squash are doing fabulously, however, so we’ve got another batch of chips in the drier. After last time, we determined that the yellow squash were best as chips, and the zucchini were probably best left to be rehydrated in the winter for soups. So, herbs and salt upon the yellow squash, and into the drier they went. The tomatoes are not ripening very quickly, despite the heat, but we’re not worried: we figure that the plants will produce what they’ll produce, and we’ll end up with fresh and dried tomatoes, as well as lovely green tomato chutneys and mincemeats. Speaking of which, thanks for the reassurance, Makiko, and the perspective upon canning and the liabilities involved in publishing a canning book. I’ve still left the onions in the fridge, and I doubt they’ll last long enough to have had to worry at all even if we’d left them out (our first quart jar was incorporated into a salad yesterday evening), but it’s good to remember that we live in a world which puts caution labels on soda bottles (“You’ll put your eye out, kid”). Am now sitting with the laptop upon my lap, watching Alton Brown drive his little BMW motorcycle across the country, eating various road-foods, and wondering at the world. My knitting is beside me, and that seems a better option. The thing is that I was knitting, but I went downstairs to make some coffee, got distracted by the fact that we have some dried figs in the cabinet which we won’t be eating in keeping with this low-carb thing, and thought that I might as well try to find a chutney recipe, so pulled up the computer & discovered this morning’s post which I hadn’t posted. It’s one of those days in which you say to yourself “coffee,” and then find yourself doing something else entirely and wonder why … and then determine that you need coffee. One last thing: I happened upon this book at the bookstore (Museum of Kitschy Stitches), and must just say that it’s an absolute scream. I picked it up because I thought it’d have some stitches in it, and knew that I had to take it home about two pictures into the book. I laughed for literally an hour. Leave a comment on SO wrong! Turduckeneasquail. Sent this link to my friend in North Carolina who’s into meat and has done Turducken before. Haven’t heard back yet, but am waiting to see if he’ll try it. Am hoping he doesn’t burn the house down trying to fry the darned thing, but he’s pretty much into overdoing anything he does, so he’ll overengineer it if he does do the deep-fried thing, and end up with some massive containment vessel, I’m sure. I figure he’s waiting for Thanksgiving, or is trying to track down a butcher who’ll do it (although, in North Carolina you’d think they’d be all over the place). So, I took a peruse through the Ball Blue Book last night in search of interesting recipes. I was told in no uncertain terms that I couldn’t make Zucchini Relish, but that the Dried Apricot and Date Chutney would be an acceptable offering. I’m contemplating mincemeats (vegan, of course) as well, as we enjoyed them so much last year, and am wondering about adding pectin to them, as the ones we did last year (green tomato, mostly, and of course apple/raisin) didn’t gel on their own. Not that it matters when you simply slap in the cornstarch and throw into a pie shell, but there’s the niggling feeling that they should be … well, not so liquid in the jars. The biggest takeaway from the Blue Book is paranoia, of course: they’re all about “you will die an ugly, horrible, botulism-paralized fungus/bacteria/spore death if you do not follow this… blah blah blah.” I know that you must cook for the right amount of time, and at the right level of acid, etc. That’s the paranoia that led me to pressure-can my high-acid jellies, and end up with lovely syrups instead of jams! So. I was wanting to invest in some means of testing the pH, to ease my paranoia, but I find that’s a bad option too: that food can change pH once it’s canned. So. I guess I’m going to have a fridge-full of the things I canned last weekend (onions), as I skimped on the vinegar. Even though I added sugar – going for a sort of hot/sweet relish – the Ball Book has gotten me once again. Enough so that when I read posts like this one, I find myself wondering if it’s high enough in acid, has been tested by some food scientist, etc. It’s a shameful thing to worry so when all manner of peasants from all over the world have been preserving things forever by chucking them in salt water and letting them bubble and rot (saur-kraut? kimchee?). So, we have the cutest little green eggplant. I think that they’re the Kermit ones shown here or here but am not sure. They hold their texture quite well, and were probably overripe even when we picked them – at about 2 inches across – they’ve lots of seeds, which tells me that we should’ve picked them even smaller! Not that I mind the seeds particularly, but that I’m just amazed. We’ve not done so well with eggplant in years past, but this blasted heat seems to have made things very happy. Well, that and the WaterSorb we tilled in to encourage drought-resistance, I’m sure. In the heat, we’ve given up baking for a bit, and are starting to get into the swing of produce processing from the garden. We’ve dried our first squash and tomatoes into chips, which are absolutely fabulous and probably won’t last until the weekend; we’ve canned our first bunch of Thai Bird peppers (love them when I get them in restaurants, just can’t stand the fish sauce they usually come in), and we’re waiting for more tomatoes. We’ve run out of our home-made pepper sauce (made from some of last year’s dried chiles de arbol), so that’s also on the agenda, but that’ll never last longer than the next couple of months – just hoping that it lasts long enough to get us to this year’s crop of chiles! So. Still trying to get into the blogging thing, which isn’t working so well – I find that I don’t have much to just broadcast out there to the world. Oh well. Going to concentrate on eating the eggplants now, and can’t wait ’til the weekend when we’ll harvest some more! OK, so, I went to the teleconference. Joy of joys, of course, as all teleconferences are, only this one’s better: it’s a video conference! And it’s being held in the Personnel department’s video-conference room, which means I get to shuffle off to the side while the tanned ones focus the camera on themselves. As if anybody’s looking? Is anybody looking at the tanned ones? I think not, but I got a look, just ’cause of the hair, no doubt, and because I wasn’t wearing my name-badge. Or maybe it was because they weren’t included in the primary conference, but had to watch from afar. Sigh. In any event, I left just when the tanned ones were starting to feel most comfortable: that’d be the point at which the consultant who was to have evaluated certain pieces of the organization’s workings said that she “just wanted the staff to have that spark that they had when they first started working here, you know…?” That was enough for me, so I bailed in time to get home to actually, maybe, knit or something? Something which wouldn’t involve my soul being drained out my ears. This is so much the reason I left the corporate world – well, that and the severance package. But still: bread. Some day, a bakery. A vegan bakery, just because 1) I’m already mostly there, so what’s the difference, 2) honey’s expensive and doesn’t really add all that much to the bread, and 3) have you ever been to a dairy? Eew. Unfortunately, I was just told that I could spend $100,000 re-doing my kitchen if I wanted to. But that I should probably expect to spend about $20K on it, especially because if you touch the kitchen, you have to upgrade the circuits, and if we touch the circuits, we’ve got to upgrade the circuit box because it’s in a closet, which isn’t allowed, and it doesn’t have enough circuits in it anyway. So, California, thanks a bunch for the extra $4K of mine you just spent. But don’t worry – I’m a consultant currently working for the state. I’ll get it back, and then some, because I know that you won’t take my advice, and I’ll need to hang around for that much longer. Sigh. What does this have to do with bread? Well, ever tried baking in an oven which heats up whatever’s on the stove, just ’cause you’re baking? Not heat, as in stuff gets warm: HEAT as in you slap a pot on the burner & it boils after a while, just ’cause the oven doesn’t quite insulate right. So, because you like to cook/eat you decide to replace the stupid oven. With maybe one that works? And, since you’re there, you decide that it’d be a good idea to use the boxed-in space beside the dishwasher, which is now just empty and inaccessible, which means you need to revamp the whole layout. Which means at least $20K. Oy. So, as I’m not baking much bread these days, much less eating it, I’ll be knitting for a while. OK, so I’ve gone and done it. I’ve gone and gotten my own place to write things other than just scabbing comments onto the blogs of others … and I must say that now I’ve got it, there’s a meeting to go to … and I really do wish I were baking. Of course, I really wish I could eat the bread I’d bake, as well, but we’re not doing that this week … avoiding all those nasty carbs, etc. Ahh, for the days when it’s all gone & I can eat bread again. Of course, that’s part of the problem, isn’t it? Eating what you cook.